I expected things to be quieter this week, it being mid-summer, however I have a nice set of links for this week. I'm enjoying my time between conference travel, starting to do some work on CSS Multi-column layout, and also getting ready to publicise my new book - details below. I also spent last weekend running up and down a hill at 5.30AM in the morning in order to take photographs of hot air balloons. Bristol is home to an International Balloon Fiesta, if you have seen one of my talks you'll know my examples are very often hot air balloon themed. This is where the photos come from. This issue is sponsored by An Event Apart. 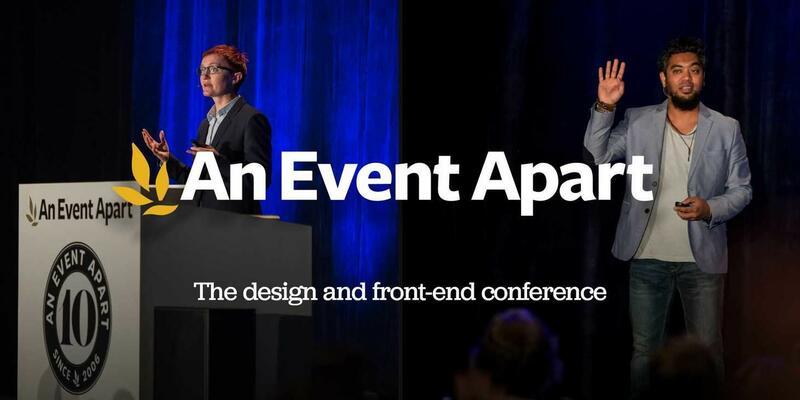 You can see me and a whole host of other excellent people speak at An Event Apart in Chicago, San Francisco and Denver this year. Check out the sponsored post at the bottom of the email for a discount code. If you would like to know when the book launches later this year, pop your email address into the page on A Book Apart. I really can't wait until it is ready to go! The Samsung Internet Beta 6.2 now supports CSS Grid. The Samsung Internet browser is available for all Android 5+ phones. Jeff Veen discusses CSS Grid Layout with Jen Simmons, Designer Advocate at the Mozilla Foundation. Covering how web standards are made, how that's different from the past, and how to keep up with it all. "Browsers operate on an evergreen update model now, so features and bug fixes get shipped much faster than we’re used to with traditional software. So the range of browsers with varying features is extremely wide. This is part of parcel of web design, where we layer on different styles and looks based on feature support." Not layout, but this fascinating article on font size demonstrates the huge amount of complexity behind the web platform and why CSS is not easy. "So there you have it. font-size is actually pretty complicated. A lot of the web platform has hidden complexities like this, and it’s always fun to encounter more of them." I get a lot of people contacting me asking how to replicate some common pattern using CSS Grid. I do wonder if we have become too obsessed with patterns that have often come about due to technological limitations - whether that be in CSS, or or the server-side. Even as those limitations are removed, we still continue to replicate the patterns. This article talks about browsing, and getting away from seeing a common pattern as a best practice, therefore emulating it. This is fantastic. A CSS-only directionally aware hover. Created by @gianablantin. You’re smart, focused, and dedicated to your craft. At An Event Apart, we bring together people like you and take your thinking to the next level, delivering cutting-edge insights and information at a conference that will energize and educate you. Whether you’re a designer, coder, or content expert you’ll learn in the same room at the same time, sharing the same ideas with your peers. Set yourself Apart. Register now and save $100 with discount code AEACSSLAYOUT.